The Australian Equine Performance Center in Midway, Kentucky, home of Double Dan Horsemanship USA (you might’ve seen Dan James at Rolex), recently hosted its first ever eventing clinic with Clayton Fredericks. The farm is absolutely gorgeous and is well setup for clinics and haul-ins. As soon as you arrive on the grounds, you realize you’re outnumbered by Aussies — and in this case, extremely talented Aussies! The three-day clinic started with dressage and after the first lesson you could start to see a trend. Clayton really focused in on the horse’s submission to the bridle and opening the throat. He reminded each rider that the horse could only track up to the point of its nose, so the further out the nose, the bigger the stride. 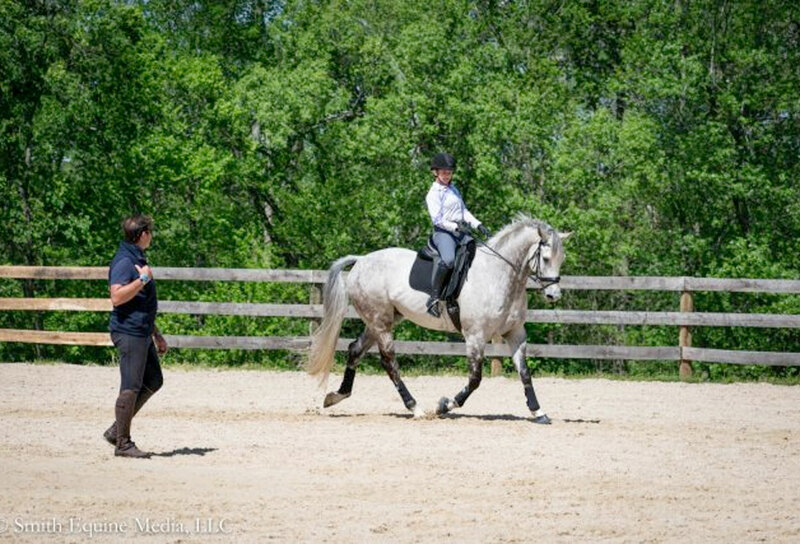 Clayton worked with each rider on a similar exercise: On a circle, turn your body to the inside to engage the hind end. And, oh, DON’T LEAN (easier said than done!). Once this has been established, use your fingertips, wrists or elbows to flex the horse to the inside and to the inside. To help riders with this concept, Clayton asked them to keep their horse’s neck straight and to imagine the horse’s head as a clock. He then asked them to very gently move the head to the inside at 11:55 and then to the outside at 12:05. This helped soften the horse’s jaw and opened their throat, which, in turn helped them to become round and to accept the contact. When a rider struggled with a horse to accept the contact and as a result the horse would throw its head up or pull down, Clayton would quickly ask them to follow the horse’s heads with their hands. He feels very strongly that pulling the horse’s head down does more harm than good, so instead take a feel with your fingers and flex the horse’s head to one side and then the other again. He preached “forward-thinking hands” to each rider throughout the day. Clayton says the number one secret to riding is keeping the horse between your leg and hand. So, there you have it! To begin the second day, Clayton had each rider canter over four individual raised ground poles set at random distances around the arena. He asked each rider to pay special attention to the balance and rhythm of the horse as they approached each pole. As riders began the exercise, he emphasized the importance of keeping three-fourths of the horse behind you. After watching each rider try and fail to do the exercise perfectly, he brought everyone in to go over what he calls the ‘strong’ position to help them keep more of the horse in front of their leg. To achieve the strong position, Clayton asked each rider to halt their horse, drop their stirrups and lift their legs up (while keeping them off the horse) until their knees were in line with their hips. After everyone took turns wobbling around, Clayton asked him or her to sit back until their shoulders were behind their hips. This position is what Clayton considers the best for when you need to balance your horse as it allows you to use the strongest parts of your body to control theirs. He also reminded riders that they don’t need to keep their legs on ALL the time — they should be used only when necessary. After returning to a ‘regular’ seated position, Clayton took turns grabbing each horse’s reins and tried to pull the rider out of the tack. At first, almost every single rider fell forward until they realized that the key to staying in position was to go back to the ‘strong’ position they had just learned. Instead of doing cross country on the third day of the clinic, Clayton changed the schedule to another day of stadium jumping to allow each rider the opportunity to solidify the new techniques he had taught the two previous days. Each horse and rider navigated two grids, keeping in mind that they should use flexion of the poll to keep their horse’s attention prior to approaching the fence, and then they should remember to get in the strong position while leaving their legs relaxed. The last exercise of the clinic was largely focused on straightness. Clayton setup a skinny with a two poles on each side providing the horse and rider with an angled line to follow. Once they felt comfortable making a figure-8 pattern while jumping each angle, he added in four more fences and asked riders to serpentine down the line, being sure to focus on the straightness of each jump.